Crusaders do not have any damage reduction bonus, unlike the melee classes of the Barbarian and Monk. This was a question we had that was answered at BlizzCon 2013 by Andrew Chambers, after getting some thoughts on the topic from Josh Mosqueira and Wyatt Cheng. Barbarians and Monks have an innate 30% damage reduction, so all damage done to them is reduced before all the defensive stats stats like Armor and Resists are calculated. The question was if the Crusader would be treated the same way, or not. 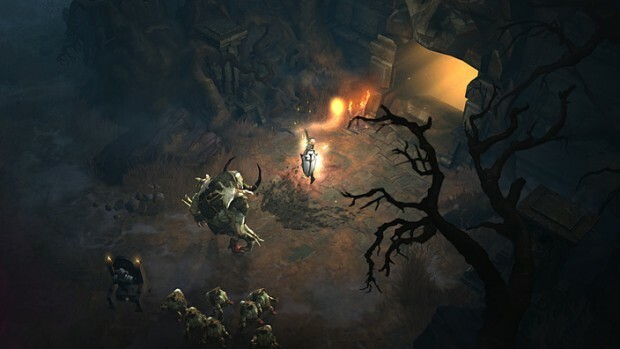 Diablo III game director Josh Mosqueira didn't know the answer off the top of his head, but he had some general thoughts about the design of the Crusader, and the class's slot trade-offs. Q: The Crusader is a mid-ranged character; will it have the innate 30% damage reduction of the melee classes, something in the middle, or none at all? Josh Mosqueira: That's a really good question that I don't know the answer to. One of things that was important for us with the Crusader, and it kind of touches on the answer, is his shield. We really have to solve the question: if you have the shield you're not dual-wielding and you're not using two-handed weapons. Are players going to be happy having to sacrifice that one slot for the shield? So, two things we've done is: we actually factor in your Block percentage, in terms of your overall damage output. And the Crusader also has a really cool passive skill that allows him to single-handedly use two-handed weapons. So do they get the extra damage resistance that Barbarians and Monks get? That's a really good question... we'll follow up. Community Manager Lylirra checked with senior game designer Andrew Chambers, who confirmed that Crusaders do not have the bonus damage reduction. Here's what senior technical game designer Wyatt Cheng had to say, in an earlier interview I had with him about a number of game topics. Q: Is the Crusader going to have the melee damage reduction? Wyatt Cheng: That's actually something we're evaluating, that's a fair question; I don't know. We had the Crusader with the melee damage reduction, we played that way for a few months. We took it out a little while ago. It's hard because he's this mid-ranged class. He's got strong melee aspects, he's got strong ranged aspects. At the end of the day we gave the melee classes damage reduction because you take more damage from melee. Of course, this gets into the whole face-tanking thing, so I think we need to be evaluating: what does our combat feel like; what does it look like; how much danger are melee classes putting themselves in; how much danger do Crusaders have to put themselves in? And if we feel he needs it, he'll get it. I'm not against doing something in between: maybe the Crusader gets 15%, or 10%. Maybe he doesn't get any at all, because he's got a giant shield and a passive that lets him hold a two-hander, and that's kind of enough. Every class is different. Of course, as with everything that relates to the Reaper of Souls Expansion, this could change as the expansion moves into beta, and during all the testing to come. The Crusader has massive defense with their tower shield, and the ability to control the field by destroying monsters from afar. For now, those advantages create a class that doesn't need any bonus damage reduction.